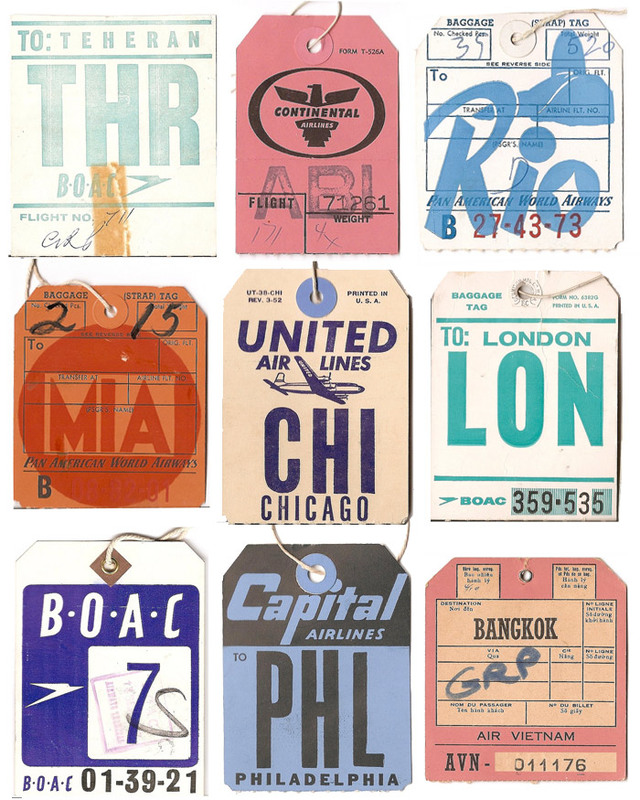 May 20, 2015 May 20, 2015 by Beau H.
Where in the world (or across the country?) will you be heading this summer? So with summer coming up quickly and Memorial Day approaching even faster, there’s a good chance you’ll be hitting the road in the coming weeks and months – be it for a music festival, a trip to see old friends, a summer wedding or some much-deserved R-and-R. Either way, how exactly are you going to get there and what are you going to bring? I’ll leave you to figure out your travel reservations — but in the meantime, get prepped to pack with all of the stylish essentials you’ll need, from a great weekender bag to the clothing you might want to throw in it. The Navali Stowaway Weekender bag in Carafe. A different color than the version up on the site now, but still a great model. While the version for sale on the brand’s site right now comes in different color options than the bag pictured above, the nuts and bolts are still the same. With a Navali bag, you get a unique combination of quality and a relatively affordable price — a bag you’re going to depend on for getting from point A to point B had better be reliable, well-built and good-looking to boot. It’s made from durable cotton canvas and features added reinforcement at key stress points and leather handles. If you’re in need of a larger or more business-friendly suitcase, you could pick up something sleek and minimal from Tumi. J. Crew Factory’s Carson Travel Kit pictured with some other travel essentials. Rubber strap watch by Stuhrling. Stainless steel watch by Invicta. 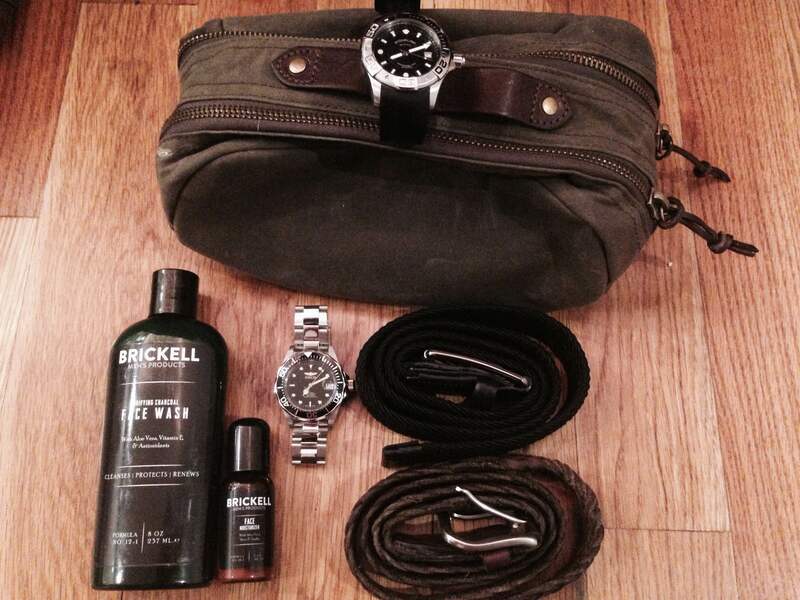 Toiletries by Brickell Men’s Products. Once you’ve loaded up your weekender bag with budget style essentials fit for a trip, what are you going to do with those toiletries? Even doing something as simple as buying a nicer receptacle for that plastic Ziploc bag to get through security helps tie together the complete travel/style combination. J. Crew Factory’s Carson Travel Kit comes in rugged shades of olive, khaki or deep navy, any of which would be a fine (and durable) addition to your travel lineup. On the cheaper yet still nice-looking side, Target is also making a nice toiletries kit. As far as grooming supplies go, you can’t go wrong on the skin and body care front with some travel-sized essentials from Brickell Men’s Products — they’re affordably priced and they really do work wonders for your skin (full review here). Navy + leather = quality your laptop can appreciate. For those of us who pack up the laptop when we hit the road, carrying around something with a bit of a luxe feel to it can be a nice upgrade. 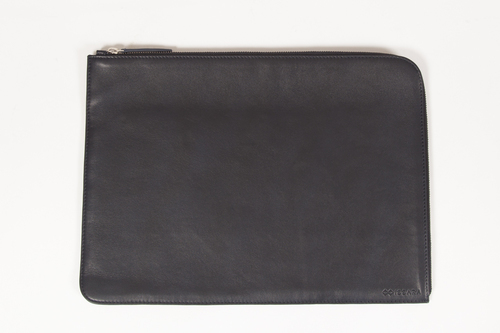 There are less expensive, sporty options out there but something made out of fine full-grain leather like this laptop sleeve feels great to the touch and befits a laptop that probably cost a pretty penny. This piece and others are available for pre-order now, so keep that in mind as you hit the road. On another note, the navy leather is another step up as far as travel gear goes. If that color isn’t your thing, it’s also available in cognac or black. 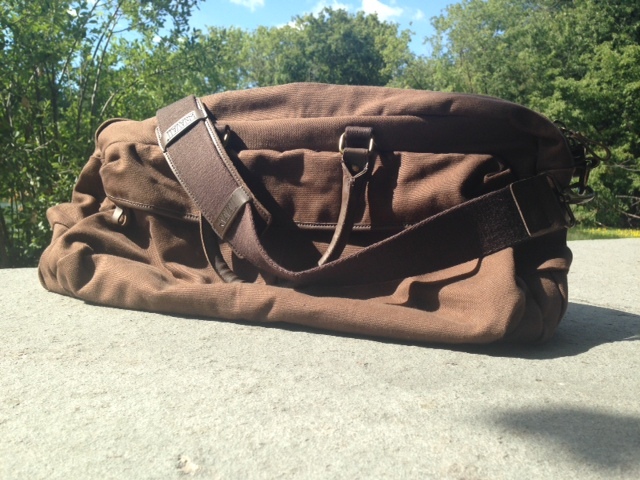 Made out of vegetable-tanned leather and with enough room for everything you need to hit the road. This accessory is another item that can easily become part of your everyday carry outside of travel, too. Linjer’s mocha billfold wallet is a beautifully crafted piece made out of supple leather. It’s got enough space for six cards and a nifty hidden pocket for important documents (or just extra cash). The site is taking pre-orders for those pieces currently, but if you travel exceptionally light and want a piece with some personality, The Hill-Side’s card cases combine excellent fabrics and leather in a slim profile. Of course, as part of your everday carry, it’d be wise to pack a sharp watch — best be on schedule! Weekend reading pictured. Would recommend a smaller book for travel. 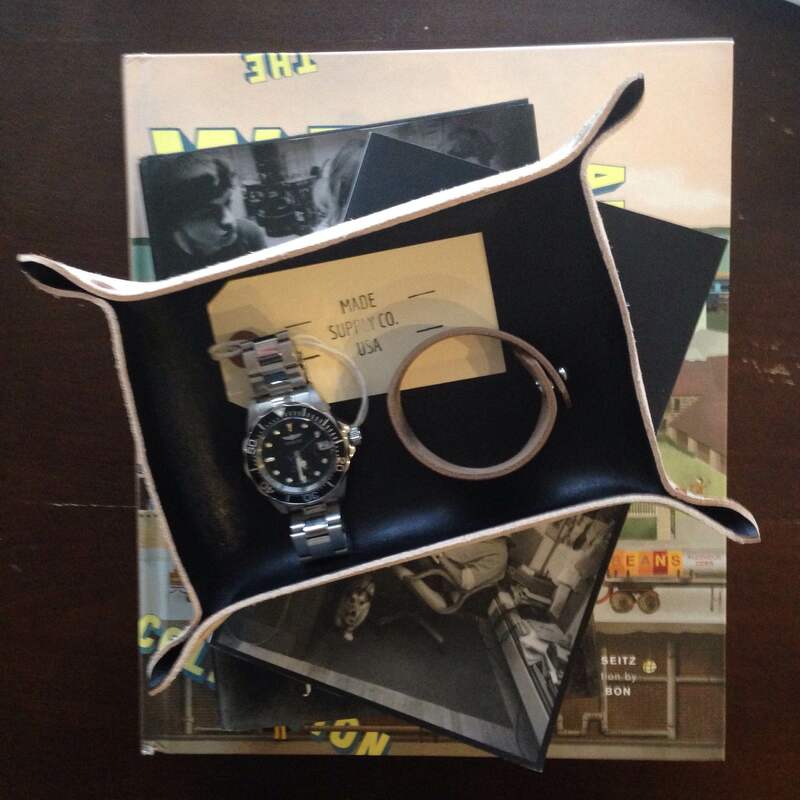 Leather valet tray by Made Supply Co. Stainless steel dive watch by Invicta. I’m a voracious reader in my spare time (if you’ve been following along with the weekly Friday Read pieces, you know that much), but getting into a great book is one of my favorite things to do when traveling. Picking up something digitally if you have a Kindle is definitely a nice option, and I also prefer excellent longform-focused sites like Narratively for digital perusal. An outfit that moves from place to place with easy. 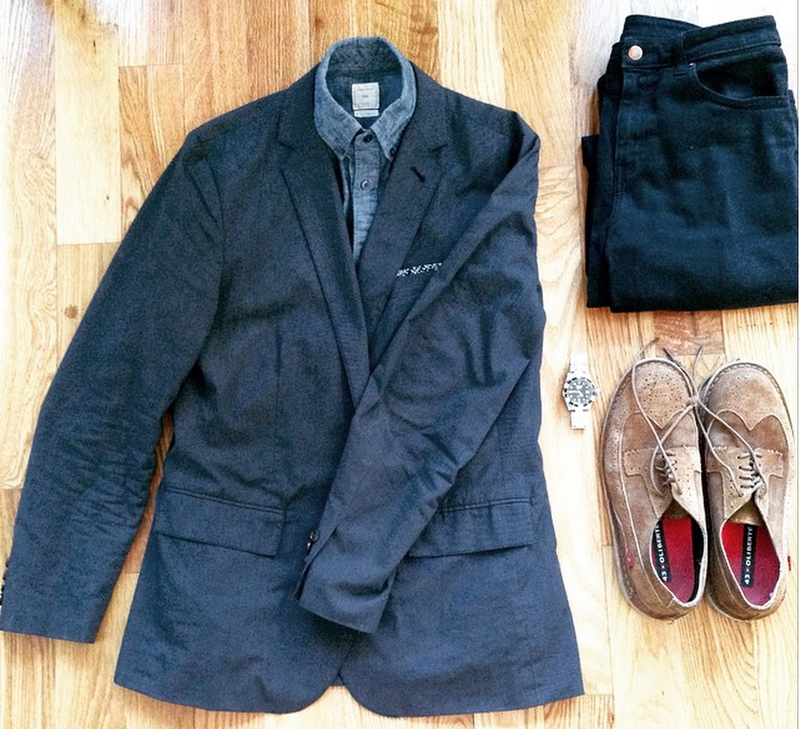 Unconstructed navy blazer by J. Crew. Chambray shirt by GAP. Suede wingtips by Oliberté. Stainless steel dive watch by Invicta. Black denim by American Apparel. What to wear while traveling is likely an entirely different post in and of itself (keep your eyes peeled for that! ), but outfits that straddle the line between dressy and casual definitely seem to work the best — think something casual-cool, like the unconstructed blazer seen above with a four-season chambray shirt and black (or blue) denim for spring & summer travel. The goal would be to look good but be comfortable moving around and sitting — the suede wingtips seen above could easily be swapped out for white sneakers, while the chambray shirt could be traded in for a pocket tee; in the cold weather, a navy wool blazer would work just the same. Conversely, a great bomber jacket and a short-sleeve henley worn with dark denim works for spring and summer layering as you travel between chillier and hotter climes. Of course, if you’re bringing a suit to a destination, the best suggestion seems to be to simply wear it — more terrific suggestions on dressing for travel from the team at Dappered over here. Now that you know the bag to grab and what to fill it with, let me know — what are your must-have travel essentials? What items not shown here would pack instead?